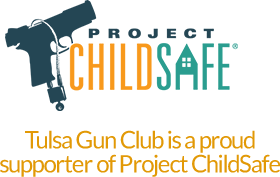 Tulsey Town is the Single Action Shooting Society (SASS) Cowboy Shooting Club located in Tulsa, Oklahoma. Nestled in the rustic forested foothills of the Tulsa Gun Club, surrounded by a Wagon Wheel Fence, Tulsey Town is a premier Cowboy Action Shooting Range. We have 8 stages built with another 14 stages to come. We are open to the general public. Non-SASS and Non-Tulsa Gun Club members are always welcome. We encourage spectators who want to come out to watch and learn about Cowboy Action Shooting. Our friendly cowboys and cowgirls are always available to answer your questions. Each of our stages represents a Site that would be found in any cow-town in the old west. Exisiting covered stages are the Church, Marshall Office, Bank, Saloon, Barber Shop and Dentist Office, Gunsmith and the OK Corral. Cowboy Action Shooting is a 3-Gun sport; Pistol, Rifle Shotgun. 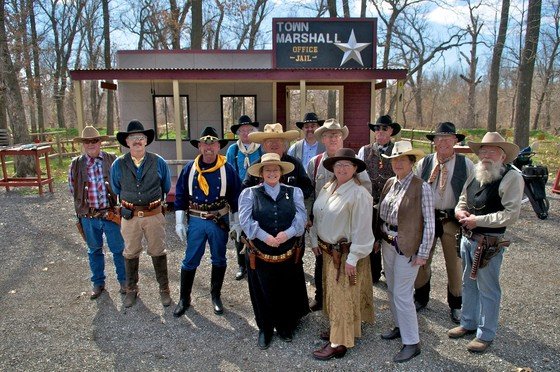 Participants use period style firearms; two single action revolvers, lever action rifle and a side-by-side double barrel shotgun, or coach gun. Shooters dress in the style of the old west and have an alias.